Starfinder: Pirate Gunboat with Drones – RPGs… in Space! As protection, this Tier 4 Pirate Gunboat is escorted by a number of small drones. 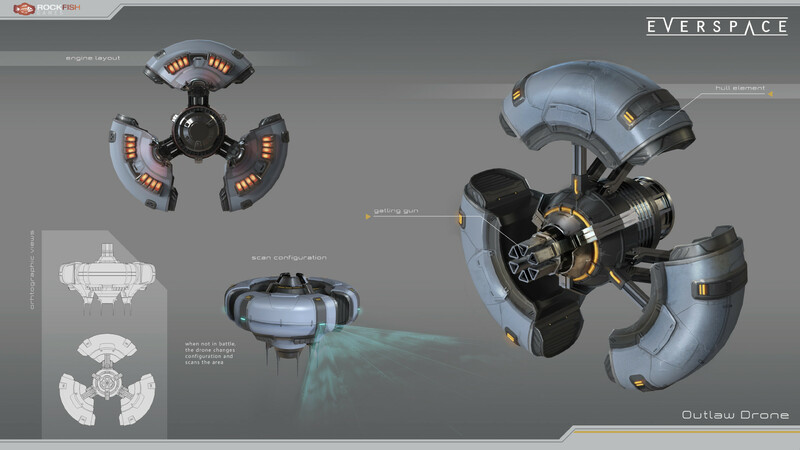 These drones operate at very low power, making them difficult to detect until the power up into weapon mode. It looks like only a single Pirate starship is approaching on sensors. I decided my version of these drones can move along in a passive sensor mode with such low power that they are almost impossible to detect with normal passive scans. Only when these drones activate their weapon system do they become observable on scanners as normal. I also wanted to have a bunch of them on the map without a tracking nightmare, so I treat them as mooks or underlings with the “Up, Down, Out” approach that’s common for many games/rules that use mooks. I gave them a damaged threshold of 5 and a kill threshold of 7, which means if they take 5 damage they are damaged, and any additional strike of 5+ (or any single hit of 7+, regardless of previous hits) destroys them. There are 3PP rules for fine/diminutive starships on RPGNow, which I loosely used. The AC was far too high for what I needed – I was happy with missiles having a hard time hitting, thematically, but I needed these guys to get hit a lot by the PC space superiority fighters for the desired cinematic effect. So I imposed a -4 AC; these drones are fragile and completely unarmored in order to augment their difficult sensor signature. These drones are also vulnerable to EMP attacks. Any successful hit with an EMP weapon disables the drone until it can be rebooted manually. The controlling ship’s science officer can attempt to reboot a single remote drone as an action, with a Computers DC of 15 to succeed, provided the drone is within active sensor range. If someone wanted to try hacking the drone signal, I’d use the controlling ship’s Tier as the level of the computer to be hacked. Since the drones are self-flying, the signal can only give certain orders, which the drones will attempt to follow. How effective that is depends on the success of the hacking attempts, but it probably affects only 1 drone per attempt. I’d use the PC starship’s active sensor range as the range of this hack.